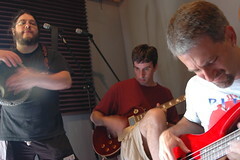 Recording "Unhatched" at Battleship Grey, July '06. Rex mans the board during the sessions for The King and I, December '02. He's the king of platypi. There is none higher. Sucker monotremes should call him "Sire". 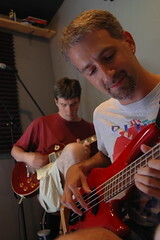 At The King and I sessions, December '02. 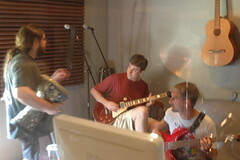 Additional pictures from the recording sessions for The King and I available at Adam's gallery. The King, sitting atop corwin's drums. Us at our first gig, October '98. Next time we'll remember to move the microphone first. Different shot from the first gig, October '98.